Shahla Sherkat hopes to convince the court to allow resumption of the Zanan-e Emrooz's monthly publication. Photo from ICHRI, and used with permission. Iran’s Press Oversight Committee has decided to suspend publication of Iran’s premier women’s magazine, Zanan-e Emrooz (Today’s Women), and forward its case for prosecution to the Iranian judiciary. 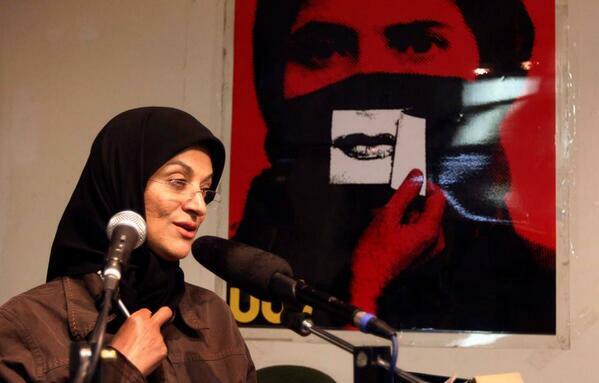 In an interview with the International Campaign for Human Rights in Iran, the publication’s managing editor Shahla Sherkat said that she hoped to be able to convince the court to allow resumption of the monthly magazine’s publication. The Mehr News Agency announced the decision by the Press Oversight Committee, stating that the reason for the ban was the publication’s promotion and justification of “white marriages,” a term used by state officials to describe the cohabitation of unmarried couples. “I have not been formally served with the notice of the decision. I read about the ban on my publication in the news,” Sherkat said. “Considering the license has not been revoked, and it’s only suspended, I am hopeful I can convince the court with my reasoning, and that we can pursue our operation again,” she added. Zanan-e Emrooz began publication in June 2014, and was suspended on the threshold of publishing its 11th issue. Prior to starting Zanan-e Emrooz, Sherkat spent 16 years as the managing editor of Iran’s prominent Zanan magazine, which was banned on February 17, 2008, for publishing content that angered many hardliners, such as advocating for equal rights for women in divorce, child custody, and inheritance, among other issues. After the ban on Zanan, Sherkat pursued a license for another women’s publication for almost seven years before she was finally granted one for Zanan-e Emrooz. According to Mehr News, the Press Oversight Committee considered content in Zanan-e Emrooz magazine “against public chastity, based on Article 6, Item 2 of the Press Law.” Sherkat told the International Campaign for Human Rights in Iran that she has never received any prior notices from government officials about her publication’s content. “I read in the news that the reason for the ban is content about ‘white marriage,’ published in an issue. I will have to wait until the court date. I have always been hopeful, and I remain hopeful this time that everything will be resolved, so that we are able to resume work again,” she told the Campaign. Issue No. 5 of the publication, published over six months ago, reported on different viewpoints regarding cohabitation without marriage. The hardline conservative Fars News Agency wrote that the reasons for the publication’s ban go beyond the issue of “white marriages.” Fars cited articles on women’s rights and the issue of women’s presence in sports stadiums as other reasons for the ban.